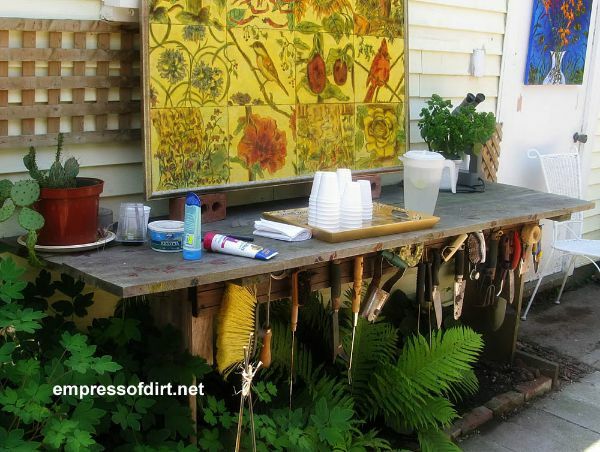 A gallery of favourite potting bench ideas from various local garden tours. 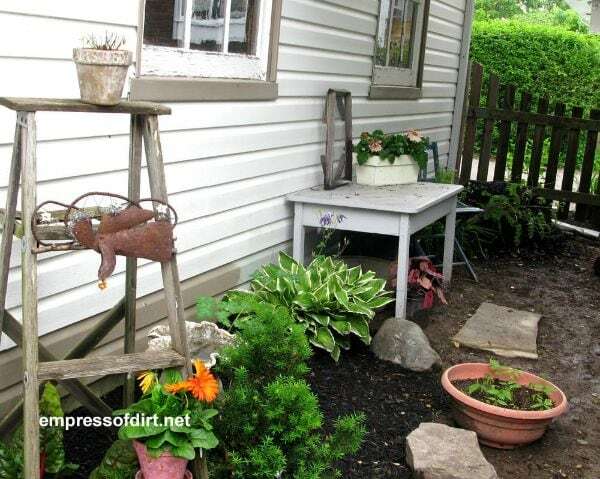 For more, also see these garden idea galleries. Often on these local tours there are quite a few other people exploring the gardens and I have to take my photos really quickly (to avoid including people in them). These photos fit that category: taken quickly, and sometimes at slightly weird angles—but you still get the charm of the potting tables. 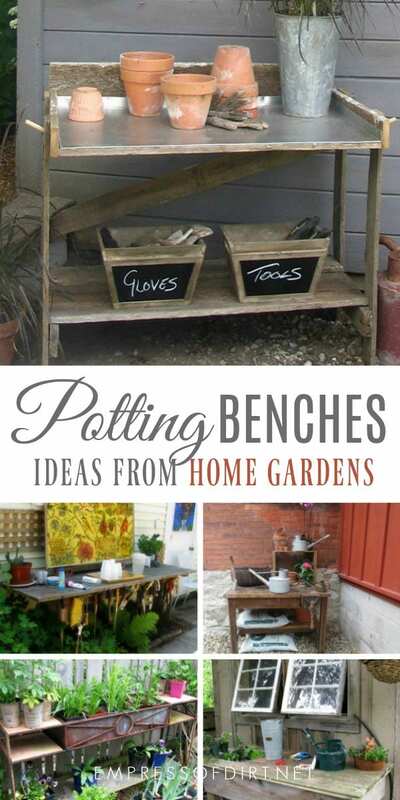 There’s lots of options for building a potting bench. Simple, rustic-looking ones are made from 4×4 and 2×4 lumber. Often these are built right against a shed wall for greater stability. 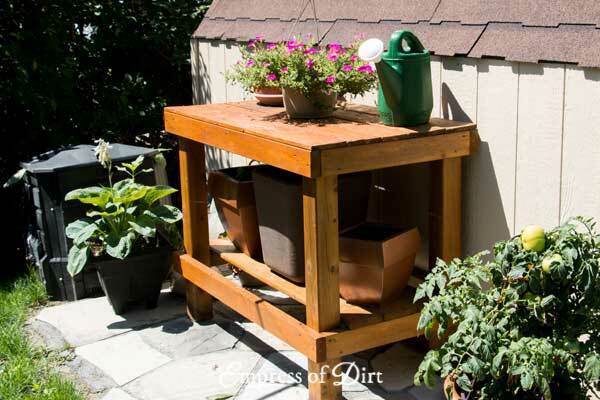 Another idea is to simply repurpose an old table or work bench. When I build mine (update: I finally made one! ), I will pick a height comfortable for working standing up, and see if I can rig up some running water or rain barrel next to it. 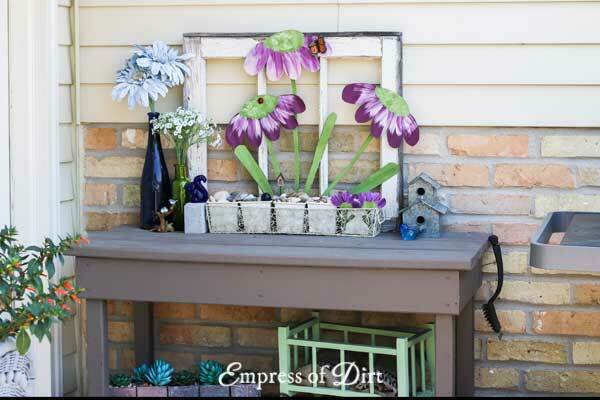 Adding garden supplies such as small tools, clay pots, and birdhouses, introduce the charm. This table is made from 4x4s, 2x4s, and some barn board to match the shed. An old stainless steel sink has been embedded in the top. I made this potting table from two bedposts. 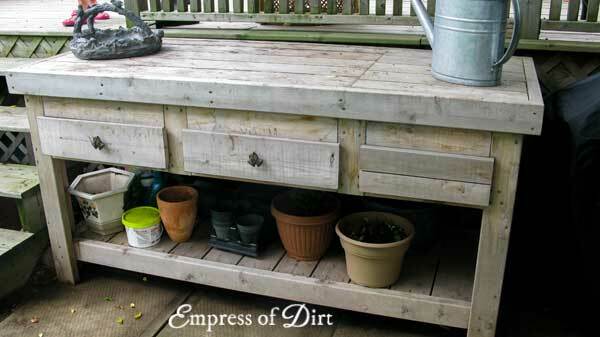 You can see more details here: DIY Bedpost Potting Table. This sturdy old table has taken on garden duty. While providing a solid work space, sometimes it’s really about the artful arrangement of stuff, including the watering can collection and orchids. Love it. Another old table, resting against a shed. 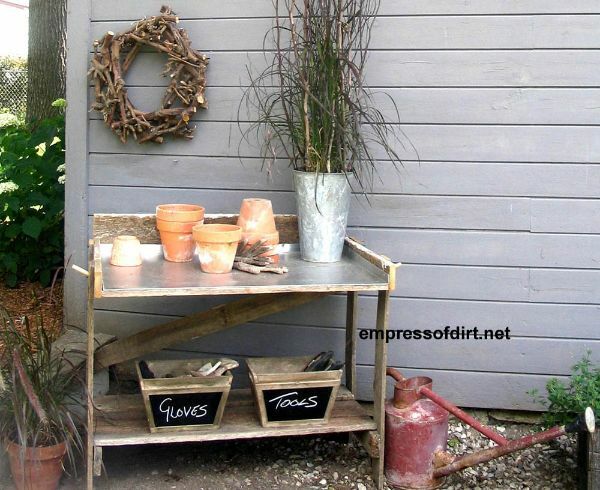 It’s both garden art and functional as needed. 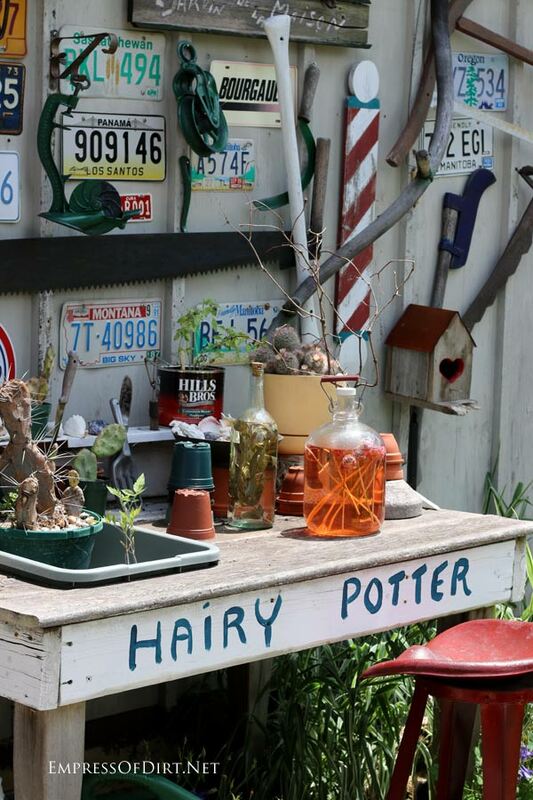 I saw this Hairy Potter garden bench on a home garden tour filled with fabulous garden junk and folk art. Love the pickled potions and cacti! 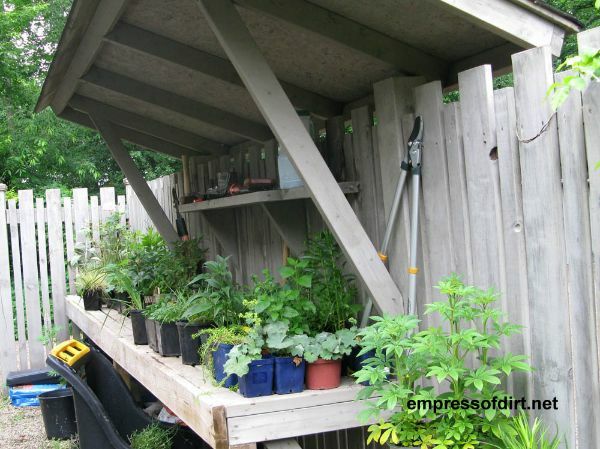 This bench is built against the fence and features an overhang to protect the potted plants from harsh rains. 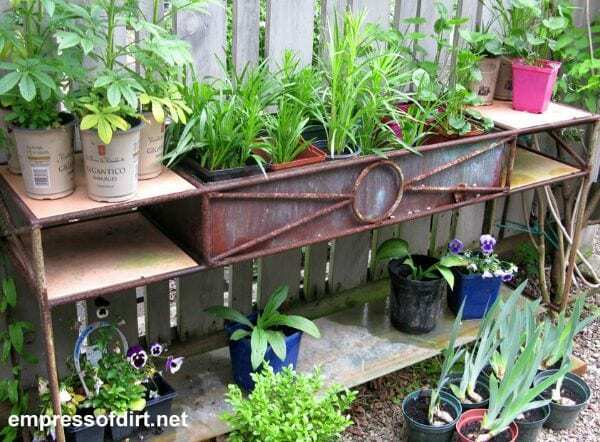 A metal table has been converted to hold plants outdoors. 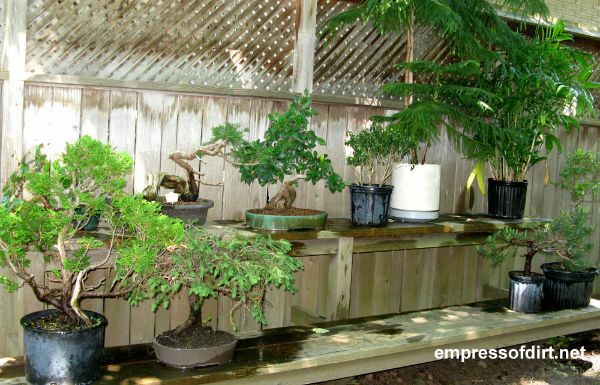 This two-level bench provides work surface and a great way to display these bonsai trees. You can tour this entire garden here. This bench is built against the side of the house under an overhang. 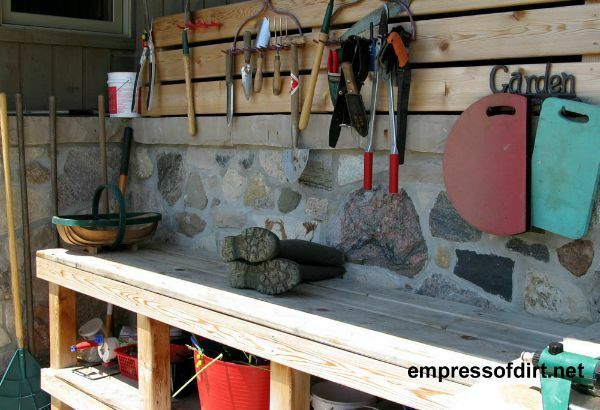 I love this setup: you can have all your tools handy without worrying about rain. 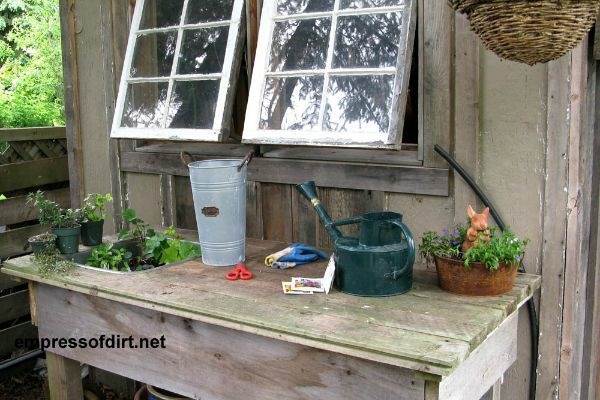 Here’s another way to protect garden tools from the weather: place the hanging hooks under the lip of the potting bench. The decorative tiles make this one really stand out. 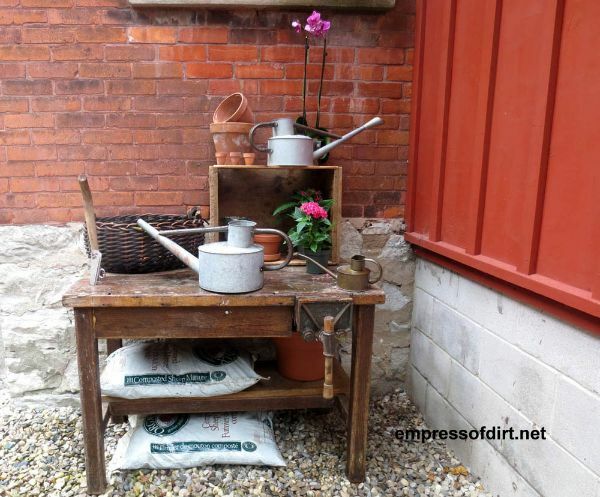 My kingdom for that red watering can! A stainless steel top was added to this old table—I love that combination of rustic and modern. This gardener definitely has the artist’s touch. I look forward yo your blog and seeing so many creative ideas in one place. Love all of these ideas – thanks for sharing!